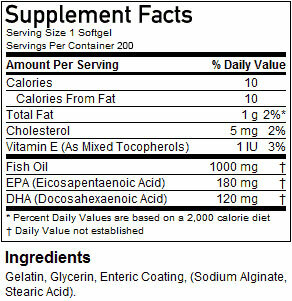 Fish Oils contain long-chain fatty acids, with equally long names like docosahexenoic acid (DHA) and eicosapentaenoic acid (EPA). 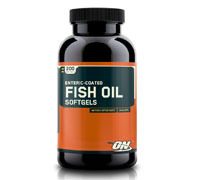 Better yet, our Fish Oil Softgels are enteric coated, which means that you get all of the benefits of fish oils without the fishy aftertaste that you might encounter without this special coating. Directions: Take 1 to 2 softgels daily with meals. Warnings: Contains fish (anchovy, mackerel, sardine) ingredients.